Still have a wicked cold, those who have had it said it lasts a couple of weeks with a cough that goes beyond that. The way I see it I’m at the end of week one so I’m at the bottom of the curve hopeing to work my way back up. So I dropped by Ba-Le sandwich shop to pick-up my prescription from Dr. Max a bowl of Pho. 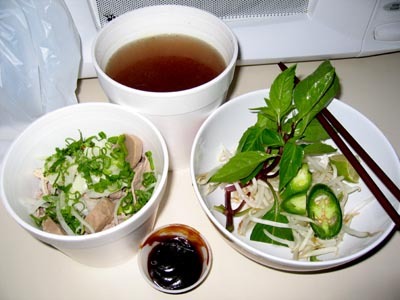 Here’s my dinner, the pho comes in four different packages. Noodles with meat and veggies on left, soup stock in back, bean sprouts, basil, peppers and lime on the right and plum sauce in the front. Just what the doctor ordered. The peppers were especially good for the sinuses. Being from a resturant family we usually prescribe saimin from Sekiya’s but that doesn’t have the peppers the pho did. 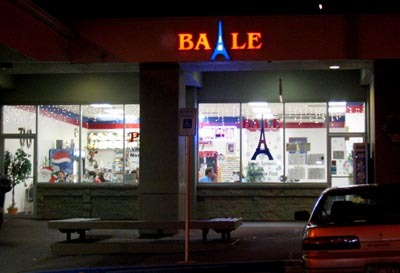 If you’re ailing I’d recommend a nice bowl of pho or saimin from Ba-Le in Kona. You’ll find it in the Kona Coast Shopping Center.